Bravo Premium Roast Lamb Twisted Stick is sure to entice any drooling doggy! 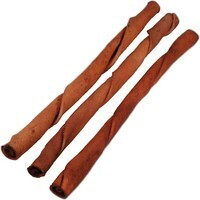 This chew treat has a rich aroma and is bursting with flavour; it will keep any dog satisfied, chewing away for hours! This yummy stick also promotes healthy teeth and gums, a number one cause of bad breath. My dogs favourite flavour is this one and the bacon one, she's a dachshund and she spends hours chewing on these things, she absolutely loves them.